Temperatures hit the upper 70’s earlier this week for the first time in a VERY long time. This winter has been brutal. Absolutely brutal. There’s really no other way to describe it. Which is why we’ll be seeking out the patio at one of Tropical Liqueurs locations this evening. There’s nothing quite like enjoying a beverage on a Friday evening on one of Trops famed patios. Downtown or their south location, doesn’t matter. Both are oases of relaxation and fun in the journey of the work week. While their frozen drinks are what they’re most famous for (we’re constantly torn between the Silver Bullet and the Tiger Paw), what we love most about Trops are the people. Their staff is always friendly, their establishments are always clean, and we always have a blast whenever we visit. Even more than that, there is an aura around Trops. Seriously. Think about it! When someone asks you about what places define Columbia, Trops is always on that list. 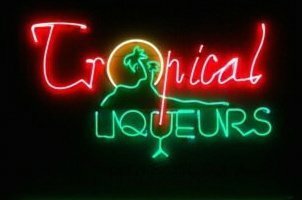 Booche’s, Shakespeare’s, Trops….that list is (nearly) endless and Tropical Liqueurs is a vital part of it. Connect with them on Facebook and Twitter. And next time you’re in, mix the Tiger Paw and Silver Bullet. You won’t regret it.